June | 2013 | Telematic Dan! District 9 opens with a docu-drama style sequence that grounds this alien invasion story on a more realistic foundation than most films of the Science Fiction genre. We not only get crucial exposition but we get a clear, active portrait of a key theme: this story is a metaphor for apartheid. The “reality-based” style of the story extends to every level — the gritty visual effects, the unlikable protagonist and the greedy corporate overseers that act as villains. 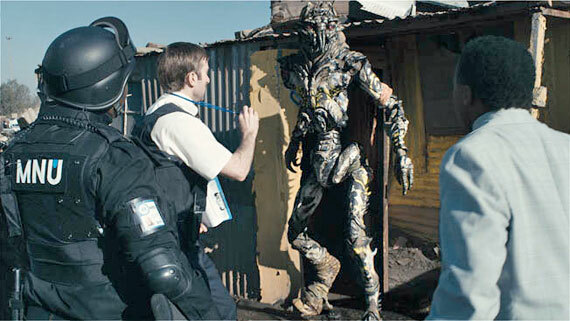 The best Science Fiction offers commentary on our modern world, and this is one of the strongest aspects of District 9. Seth McFarlane’s Ted puts a twist on two oft-enjoyed genres: the buddy comedy and the “boy and his dog” story (which doesn’t have to literally mean a dog. E.T. is a “boy and his dog” story.) McFarlane made the boy into a man who never grew up, and his best buddy into a foul-mouthed, pot-smoking teddy bear come-to-life. Once we’re past the initial gag of a teddy bear dropping f-bombs, we can focus on McFarlane’s true muse and the main source of his humor: Eighties pop culture references. Whether or not this is a good thing, you can decide, but I think we can all agree that it’s a pretty unique mix of familiar elements and Flash Gordon is, in fact, so bad it’s good. The Hobbit: An Unexpected Journey expands on plot elements that were barely mentioned in the J.R.R. Tolkien book to provide greater motivation for the characters and a more focused thematic arc. The book is an episodic story with some inactive elements that arguably would not “play” as well for modern movie audiences without some tweaking (e.g., the heroes are saved three times; twice by Gandalf and once by the giant eagles). And since our adventurers will not catch up to Smaug the dragon in this first film of the trilogy, and Peter Jackson needed to justify an action sequence for a final act to follow the terrific goblin cave chase sequence (one of the great 3D action sequences of our time, in my humble opinion), he decided that Azog the most-handsome orc would be the active villain to anchor this final set piece. Azog is only mentioned in a single line in the book, and he never faces Thorin in battle, but the filmmakers decided to build in a backstory where Thorin cuts off Azog’s arm and leaves him for dead, only to learn later that Azog lived and has put a bounty on Thorin’s head. This gives Azog motivation to return in the final act and it gives Thorin some sympathetic edge (Azog killed Thorin’s father, which is true to the source material as it is mentioned by Gandalf in that single line in the book). The opening flashback sequence also establishes how Thorin and his fellow dwarves went into hiding when they were driven from their home kingdom by the evil dragon Smaug. It is this motivation — the quest for a home — that binds Bilbo to them and provides the emotional connection to the theme of the film. In other words, this is not just a fun story about an adventure to steal some gold, it’s also a heartwarming tale of refugees coming home. Tolkien’s stories of hobbits have always foregrounded home as a major theme, in fact you can see it right there in the full title of his book: The Hobbit, or There and Back Again. The Shire is always depicted as a great place of carefree comfort, one that any self-respecting hobbit would be crazy to leave. This theme will no doubt provide a strong driving force for the narrative through the full trilogy. So if you’ve decided to go big and you aspire to write a Summer tent-pole, then I hope you find some unique takes on your chosen genre to add some spice to that too-often stale popcorn.